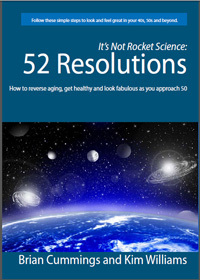 It’s Not Rocket Science: 52 Resolutions by Brian Cummings and Kim Williams shows you how to slow or even reverse aging, get healthy and look fabulous. While a lot of the material on the market about reversing aging is based on complicated medical studies, this book contains easy suggestions for changes you can make either one at a time or collectively to improve overall health and wellness. Even incorporating just some of the suggested action items will help slow the aging process. The resolutions follow a rotation of Reverse Aging, Diet, Fitness, and Wellness. Each resolution is followed by supporting information and a simple action plan. Why spend thousands on creams, potions and procedures when you have the power to slow aging by what you choose to eat, think and do? The possibility to slow—or even reverse-- the aging process and improve both physical and mental health in the process await you in this book. The suggested steps are common sense, proven methods to look and feel better and live a longer, healthier life.